It would cost $22.1 trillion (17.9 trillion euros) to $41.6 trillion between 2020 and 2050 for the world to hold average global warming under two degrees Celsius (3.6 degrees Fahrenheit), a team projected in The Lancet Planetary Health journal. 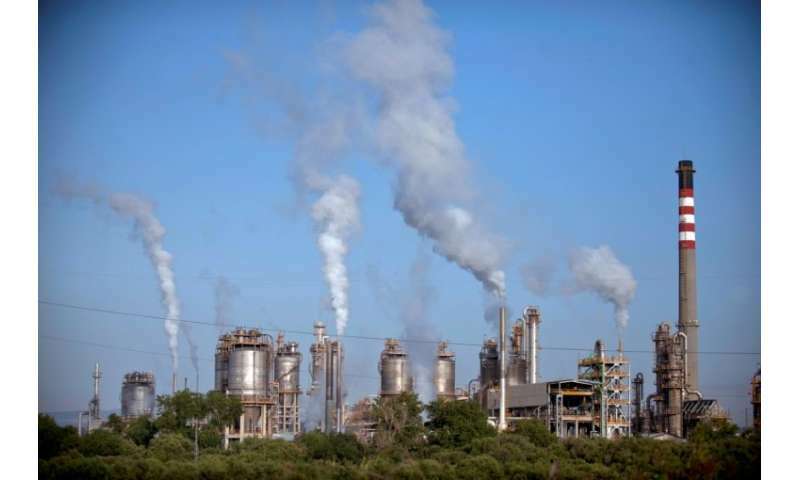 "Depending on the strategy used to mitigate climate change, estimates suggest that the health savings from reduced air pollution could be between 1.4-2.5 times greater than the costs of climate change mitigation, globally," they wrote. Health costs from air pollution include medical treatment, patient care, and lost productivity. The countries likely to see the biggest health savings were air pollution-ridden India and China, said the researchers, who used computer models to project future emissions, the costs of different scenarios for curbing them, and the tally in pollution-related deaths. "The health savings are exclusively those related to curbing air pollution," study co-author Anil Markandya of the Basque Centre for Climate Change in Spain told AFP. "Other health benefits are not included, which of course makes our figures underestimates of the total benefits." The costs of limiting warming, Markandya explained, included higher taxes on fossil fuels like oil and coal, which in turn raise the costs of production. The world's nations agreed on the 2 C limit in Paris in 2015, and undertook voluntary greenhouse gas emissions reduction targets. These pledges, even if they are met, place the world on a 3 C trajectory, scientists say. To date, the average global temperature is thought to have increased by 1 C since the Industrial Revolution. "We hope that the large health co-benefits we have estimated... might help policymakers move towards adopting more ambitious climate policies and measures to reduce air pollution," said Markandya. Air pollution from fossil fuel emissions, particularly fine particulate matter and ozone, has been linked to lung and heart disease, strokes, and cancer. Get rid of the problem in a jiffy by Switching to Renewable Energy; NO MASSIVE BATTERIES to store energy is needed. JUST Learn to Build PYRAMID SIZED MOUNTAINS OUT OF cheap,sturdy Polymers on Sea Shores where Water is Abundant! Wow! Good thing scientists and engineers have figured out how to produce renewable energy for less than fossil fuels and people will switch over without any global government controlled interventions. Because this article was a whole lot of gobbly gook. The cost of fossil fuels today doesn't take into account further expenses with fighting the effects of global warming. So in a way it makes sense to put taxes on fossils. Moving away from fossils has further benefits; firstly it would create a more diversified economy with less reliance on just one type of energy source and thus a more stable economy overall. Fossil fuels are going to become obsolete anyway, probably in about 20 years. Renewable energy is developing well and if breeder nuclear reactors are going to be developed too that will be a big hit on fossils. The problem is CO2 will stay in the air, unless we develop a way to scrap it - say by ocean fertilization or chemical absorption into rocks. In other ways it doesn't, because governments get addicted to taxes and that ensures reduced efforts in actually getting rid of fossil fuels. Part of the reason why for example there isn't greater effort in developing techniques to reduce fuel consumption in vehicles is due to the fact that the government knows, and the industry knows that the government knows, that reduced fuel consumption would reduce the massive tax income and put governments into insolvency. So there's this stalemate of mutual interests where every party is dragging their feet, because the government cannot back off from the spending commitments it has made to buy votes, and the industry doesn't want to bear the cost of changing how they operate or go out of business, so they start making backroom deals to keep the business as usual. Instead of taxing carbon, the governments would have to figure out how to get taxes out of renewable energy. "In other ways it doesn't, because governments get addicted to taxes and that ensures reduced efforts in actually getting rid of fossil fuels"
You jump from governments being addicted to taxes (while ignoring the ones that cut them) to a conclusion that such addiction to taxes will automatically undermine transition away from fossil fuels. Such an effect is entirely dependent on how that tax money is directed, toward or away from research into and support of alternatives. 'Addiction to taxes' won't change the effect of a fossil fuel tax on the disincentive that a higher price has. You're making an assumption that fits the picture that you want to present without establishing credible causation. By all means, go ahead a build a case that any fossil fuel tax will, by one or more clearly defined mechanisms related to government, slow the transition away from fossil fuels to alternatives. Show us how it is inevitable, for admit you're just making it up. Don't you love how people pull these numbers out of the air (or somewhere)? Extending over time and tweaking parameters this looks like the onset Malthusian Trap on a planetary level. Although the math is algebra the math impaired trolls cannot understand it, therefore don't comment. Assumption 1 - The preponderance of the world is transitioning from poor to middle-class and is not going to slow income growth or lessen demand elasticity. Assumption 2. - The OECD countries are not going to lower their standard of living. Assumption 3 - Population growth and rising income will at some point reach such levels of environmental degradation that morbidity will reverse and then hold population growth at some equilibrium point. Assumption 4. - This is a proper understanding of the equation on page e128. Therefore in order to hold the value of statistical life (VSL) at some constant then saving the planet will require a declining standard of living for India, China, and/or the rest of the world. China and India won't agree to this. War over control of resources would be the only means to enforce. What was not found was the direct effect of transition to non-hydrocarbon energy sources. Maybe that would mitigate the doom. Record snow is record warm is that right? When you mess with mama nature, she isn't going to be nice to you in return. The actual technical explanation involves weakened polar vortices and climate change induced modifications to the jet streams, but for the scientifically disinclined, just imagine it as the revenge of the big mamma. It is not that a warmer climate is intrinsically worse, it is that we have adapted to the climate of recent times, with cities on the current coastline, and crops planted for the current weather patterns. So a rapid change (whether to warmer or colder, or major shifts in rainfall patterns, etc.) is unlikely to be nice to us. Some areas may get better, but on the average rapid change will make more things worse (until we have time to adapt to a new normal). Alarmists playing games with big numbers again. Still nowhere close to reality. When your multimillion-dollar computer simulations generate estimates of future temperature rise that aren't even in the ballpark of actual measured temperature rise it's obvious your estimates of global warming "costs" and the imaginary "benefits" of massively onerous restrictions on energy production can be taken as seriously as a haruspex examining sheep entrails. FYI, all the disaster scenarios are based on RCP 8.5, the graphs that are furthest from actual measured temperatures. Apparently alarmists don't actually read their own data, or they expect the gullible public to not fact-check them. Blah, blah, blah. If you can't dazzle them with brilliance, baffle them with BS. A process is called nonlinear when there is no simple proportional relation between cause and effect. The climate system contains many such nonlinear processes, resulting in a system with potentially very complex behaviour. because the climate system is inherently nonlinear and chaotic, predictability of the climate system is inherently limited. The linguistically correct description of the "scientific explanation" of how record cold and snowfall are caused by global warming is bupkis, as in "you got bupkis." I agree in large part with your analysis. Actually we have figured out how to raise taxes off renewables - and the law makers are already figuring out how to apply a mileage tax on cars - when we see the upcoming drop in gas revenues - with electrification of transport. Trump is proposing toll roads also. Chesapeak, Devon, and Continental are the three oil companies that anchor the Oklahoma City (my town) economy. It is not just about taxes - but a deep rooted culture. Good old boys - doing back room deals - filling their own pockets. Look into the web of - Trump, Kushner, Manafort, Gates, Page, Putin, Russian mafia etc. story. It is not just about taxes - it is about the halls of power. Every liberal plan claims to pay for itself and save billions of dollars. Yet after 50 years of liberalism, as a nation, we are pretty much bankrupt and many are now unable to earn enough to support themselves. Obamacare is a PRIME example of false liberal claims. Health care insurance costs and deductibles skyrocketed for the average worker. These costs were supposed to me lowered by billions but it never happened because the healthy young never enrolled. Of course now that Trump has eliminated the individual mandate Obamacare will go bankrupt and be replaced with the old system. 166, please take your neo-nazi stuff elsewhere. Then, you can PAY for your Republican Wars. Gkam you and your liberal friends are always trying to pass laws in order to control the actions of others. You are the neo-nazi and are too brain washed to even realize it. Antifa is a prime example of this sort of mentality when they riot against free speech. Who imposed the Republican Police State on us after their Criminal Negligence on 9/11?? The dictators wannabees of the proletariat never stops lying. Weaponization of the Federal government was done under the Obama Admin, by illegal executive order. He turned the IRS, EPA, FCC, BLM, etc. into persecutors of those who don't think right. Giving federal authorities the right to carrying guns is the same as giving idiots guns. Heavy weapons were distributed to law state and local law enforcement agencies. George you show you are a pathological liar all over the place. Did you also fly B-17s in WWII? This scenario does not account for the fact that a good number of sources, including auto manufacturers, are predicting peak oil demand to occur between 2020 and 2030. This does not apply to NG or NG liquids. Those most concerned about AGW and CC should consider what they might do to accelerate this movement away from hydrocarbon. How about demanding the Fed Gov. dispose of spent reactor waste as they promised in the 50s? Unless there is a battery or capacitor breakthrough renewables have limits. Further a world of windmills and solar farms ain't that great. Hydro-carbons aren't acceptable for load balancing. Uranium/plutonium reactors aren't acceptable. How about a compromise? Thorium reactors are existing technology. There are hints of alternatives to the tokamak fusion reactors. How about some focus there? It is time for the Deniers to take a simple course in Environmental Economics, to see the ratio of cost of abatement equipment versus health care cost savings for emission reductions. In the 1980's when I was doing my thesis it was well over 30:1, the benefits of pollution abatement to the cost of the equipment. You're just playing with me right? This means you would have to do math, which you are clearly incapable of. If true then make a critical and professional assessment of the equation on page e128 of the paper, which represents the essence of the paper. Any paper that claims that pollution kills x amount of people a year is bogus by definition. Smoking, heat, cold, poor diet and most ot the other preferred causes kill the same people which are counted multiple times. The only correct way to quantify the dangers involved is to state the length of time that the problem will reduce the average life span. In other words if I am 80 years old and in poor health was it the hot day that killed me or my bad heart? Sorry, liberal arts classes aren't exactly scientific. Or accurate. And we're called skeptics. Deniers are the people who deny that the Holocaust ever happened and I'm pretty sure most of them couldn't care less about health care cost savings and emissions. We skeptics understand epidemiological studies and can tell when statistical analysis is being used to flog the data to produce a causal relationship that the data doesn't actually show. The classic junk science claim is that reducing PM2.5 particulates "saves" thousands of lives per year. It doesn't. It's statistical nonsense. No study has shown that PM2.5 particulates actually kill people. Thanks for the reminder, MR166. Once again, this comment section is where libertarianism tries to beat up science and science points out that if you had facts you wouldn't need fists. Here is an example of the liberals at work. No hate there eh! Science Lee? I say not but politics yes. The data from the ground based temperature sensors have been turned into nothing more than propaganda. Rural stations have been discontinued and others have been warmed by development. When a measurement as simple as a thermometer needs to be "adjusted" you know that it was not valid to begin with. Would a simple course in Gender Equality and White Privilege suffice for Environmental Economics? Environmental Economics, what a laugh. Except for a few exceptions, one wind farm that I know of, none of the projects have delivered the amount of energy promised. During one of the driest years on record Ivanpah did not meet expectations because of "too many clouds". Face it, the whole field just lacks basic honesty. There are only a few temperature stations located in remote areas. With the advent of batteries, solar cells and satellite internet they could easily have 10 times the number of pristine stations located, in remote areas, that do not need adjustments for urban heat. I bet it would cost way less than say $10 million. This will never happen because real unadjusted data will harm the agenda. We skeptics understand epidemiological studies and can tell when statistical analysis is being used to flog the data to produce a causal relationship that the data doesn't actually show. Agencies, like the EPA, which further push out conjecture like "Radon is the 2nd largest cause of lung cancer", cause any educated and rational person to be skeptical. These are bureaucrats perpetuating themselves with the political wind. Global record warming heats the oceans more which evaporates more water. That in-turn creates clouds with more stored water, and in cold weather, that means more snow. So yes. Record snow is due to record global warming. @MR166 as is typical of the trumpians, all science and facts seem to be against what stupid crap they feel they should believe. So you can't understand how a thermometer works? That OK trumpian flakes just make up stuff about how broken thermometers are. It's too bad Obama couldn't round you trumpians up and stick you all in a damn FEMA "re-training" camp. You must not be a real american because americans aren't that god-damn stupid. ". So you can't understand how a thermometer works? " That's the problem HH3. I know how they work and you seem to think that one can be placed anywhere one wants and ACCURATELY measure point one degree/decade changes. ... your liberal friends are always trying to pass laws in order to control the actions of others. You are the neo-nazi and are too brain washed to even realize it. Antifa is a prime example of this sort of mentality when they riot against free speech. Haha. Like the oooo-soooo-scarrryyyy antifa is even real. The antifa is just a bunch of kids that stand for real American values. If your a Nazi, racist, prick, you may not like American values. As an Australian looking in from the outside, I could never understand how "antifa" could be a *bad thing*. Seriously, how can one see Antifa as other than Sturmabteilung? Seriously, all politics aside. When masks are worn as people are beat up??? How much is electricity from a magic over unity machine mackita? These taxes are necessary for subsidization of renewable energetics in Denmark - its extensive network of offshore wind plants in particular. Because no energy comes for free - not even this one required for building and maintenance of "renewable" wind plants. And building these plants also consumes energy, just somewhere else - during mining raw sources, production of steel, concrete, neodymium, copper and so on. The common measure of this dissipated energy are the money which Denmark pays for its "free" energy. If no alternative energy source can compete the coil and oil which are about to deplete, then the only logical conclusion is, we must turn our attention to research which has been ignored for one century - the research of overunity and cold fusion energy - no matter how esoteric it may look for someone. In sufficiently distant perspective there is no other option where to go (I mean other than nuclear war, which would eliminate the global demands of civilization). As one who sympathizes with the rare few scientist working in CF, I hope them well. As far as your pipe dream of over unity being the salvation of planet Earth, grow a brain cell. The sun drops terawatts of renewable energy on Earth each day! The whole planet (human race) doesn't use a small fraction of 1/10 of that, If there is no usable CF, we will survive. What amazes me is the #climatedeniers arguing to die of the results of their denial. They're actually willing to die after a period of agony measured in years rather than admit they're wrong. And they don't care who dies with them. another junk science study based on maybe, possible, we think, etc. there is zero epidemiology support for all these death claims. Natural gas and nukes are very clean related to the air. CO2 does not kill. In fact it greens the planet (see current studies of satellite evidence). Add to that, more people die in colder times than warm times. The population exploded in the Roman Warm Period and the Middle Ages Warm Period. Masses died of in the Little Ice Age and other cold periods. That is a lie. Renewables are the cheapest source of energy - and Denmark is just one example of a country on the road to 100% renewables. I could have mentioned Germany, Norway, Scotland, or England, etc. etc. The point is that renewables are the cheapest, cleanest source of energy - and your over-unity is currently not available - so who is pushing unicorn farts? It means they are not currently available. Realists work with what we KNOW. Realists don't bet the farm on a wish - they employ technologies that are proven and understood. Nutters bet the farm on promises - without evidence. Which sentence from this article you didn't understand? The costs keep tumbling - currently around .06 Euro per Kwh. How much was the electricity from your imaginary over unity machine going to cost.